Post-Emergency, multi-hazard health risk assessment in Chemical disasters (PEC) is a prevention and preparedness project funded by the Directorate-General Humanitarian Aid and Civil Protection (DG ECHO) of the European Commission aiming at developing and implementing an integrated model for rapid multi-hazard health risk assessment applicable to chemical release incidents occurring during major natural or man-made disasters. Under this perspective the main problem targeted by PEC is the assessment of the impact on human health due to exposure to chemical agents originating either from natural or manmade disasters, such as earthquake, flood or terroristic attack affecting chemical plant structures and infrastructures finally leading to accidental release of large amounts of toxic chemicals into the environment. The PEC method and tools will be applied on a case study area located in the South-Eastern part of Sicily (Italy). Immediate and long-term population health impacts of the toxic chemicals absorbed either individually or in combination will be determined and quantified according to (i) characteristics (type and intensity) of the initial disaster, (ii) degree of vulnerability of buildings and infrastructures, (iii) quantity of chemicals stored/handled in the plants, magnitude of their dispersion into the environment and levels of chemical contamination in the disaster area. 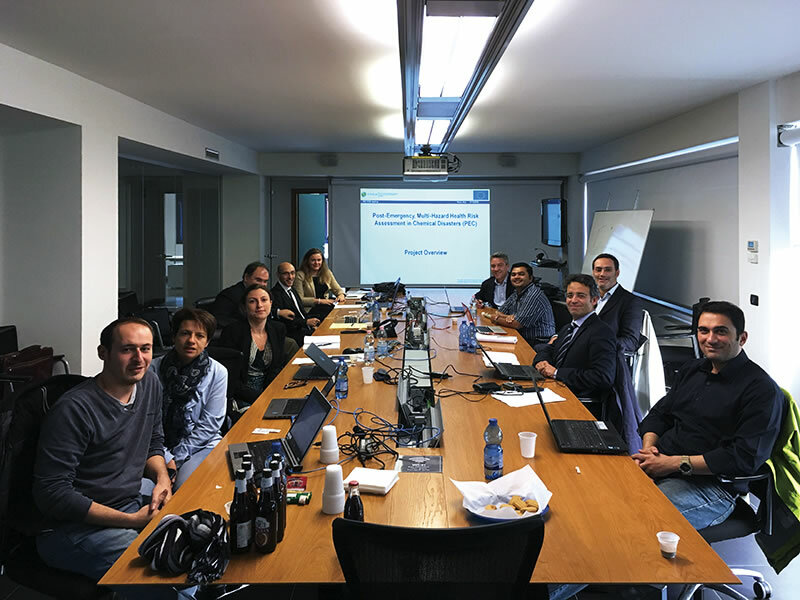 For each type of hazard considered in the project, its determinants will be identified and estimated using statistical and physics-based models (for natural events) and expert judgement including historical databases (for man-made events). 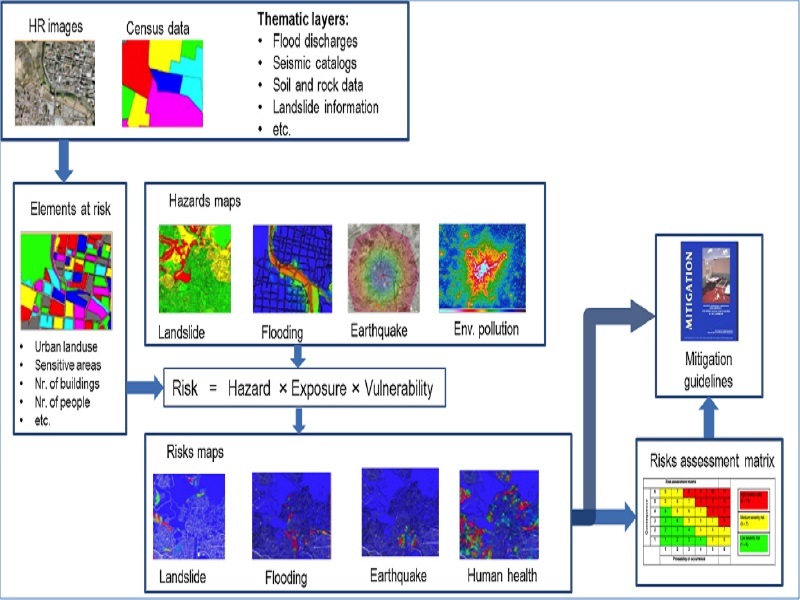 Risk evaluation of natural or man-made disasters will be carried out by techniques of quantitative risk analysis coupling the probability of occurrence for both initiative and intermediate events along the risk chain with quantitative estimates of consequences. Environmental contamination from toxic elements and population exposure will be modelled through state-of-the-art atmospheric dispersion models coupled with an enhanced multimedia model used for regulatory monitoring and compliance purposes to derive concentration levels of toxicants in different environmental media (i.e. surface and groundwater, soil and air) and the food web. Exposure will be assessed by estimating the total daily intake of toxicants based on their predicted environmental concentrations. 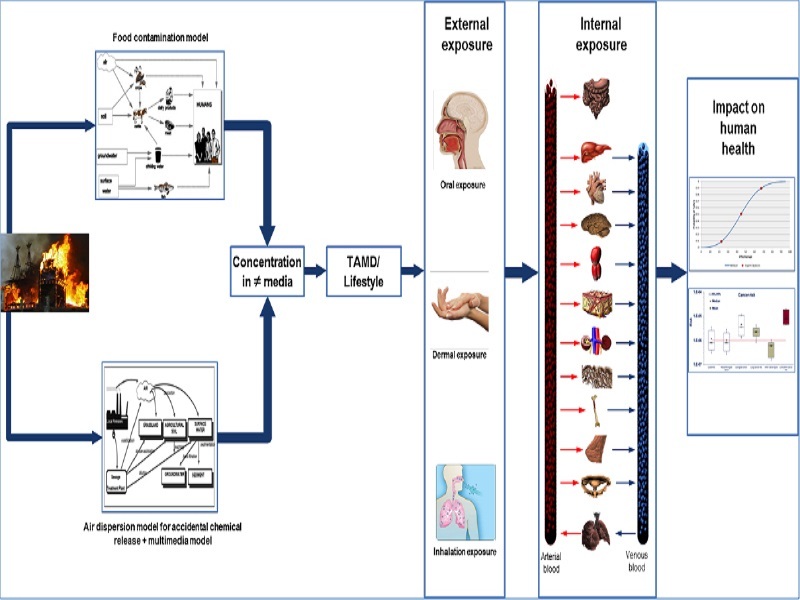 Internal exposure will be derived using in silico methods (PBTK, exposome-oriented approaches) resulting in the quantitative estimation of toxicants in human tissue. Likelihood and severity of predicted effects will be estimated in terms of number of persons affected, short term mortality, overall morbidity, prevalence of local irritation symptoms, and organ/system morbidity requiring hospitalisation. Results obtained from the simulated incident will be validated against clinical data obtained from published case reports and practical experience in medical toxicology and emergency medicine.